Xel-há is so much more than just one of the best aquatic parks in the world, with underground rivers, extreme activities or the all-inclusive Xel-há package, it has plenty of things to offer, including 5 that you might not already know. We want you to know this incredible place very closely, besides living a swim with dolphins in Cancun, you will be learning and taking care of the environment without making a big effort. To swim with dolphins in Cancun is definitely one of the most incredible experiences, however, being under water with these mammals is something that you can only do in two places in the world, and Xel-há is one of them. 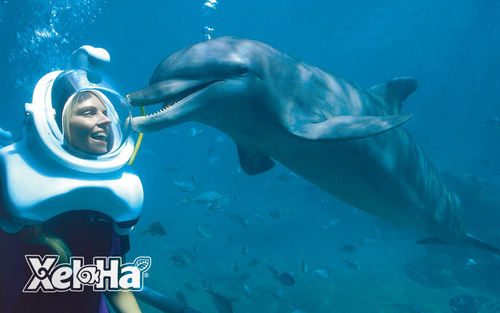 You are required to wear a special helmet (Sea Trek) designed to dive, that only Delphinus has for this activity with dolphins in an entire natural environment. Did you know that Xel-há is the world’s most sustainable park? In 2014 it became the first company in the world to receive the EarthCheck Gold International Certification, given by the world’s leading scientific benchmarking certification and advisory group for the travel and tourism industry. If that weren’t enough, it also received the Distinctive as a Socially Responsible Company, the Trip Advisor Excellence Certificate and the Prize for the Best Business Practices for the Preservation and Conservation of Threatened Species, such as pink snails. Because Xel-há understands very well the need to educate little ones about caring for the environment, it invites 100 kids daily to workshops and tours, showing them the importance of preserving the natural resources that Quintana Roo and the rest of the country have. Full-day entrance to Xel-há park and access to over 20 activities. 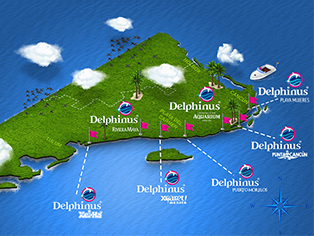 Swim with dolphins in Cancun, to choose between Primax, Interax or Dolphin Ride. Snorkel with dolphins, equipment included. It is the world’s biggest natural aquarium! Because of its dimensions, it can fit 84 professional football fields, Xel-há is considered the world’s biggest natural aquarium. It is composed of several coves that flow into underground rivers, as well as various Cenotes: the Cenote Aventura, Cenote Paraiso, the Mayan Cave and the Black Lagoon. If this is not enough to you, its beach has the most white turtle nests in the country. What are you waiting for to take advantage of the all-inclusive Xel-há package and enjoy a holiday like no other! This ecological park is waiting for you with open arms.